Where does Europe begin and where does it end? This is an open ended question with no easy answer. The answer can vary, depending upon politics, culture, linguistics, economics or any number of other parameters. When it comes to geography, the popular conception for the northern end of Europe is likely to be somewhere above the Arctic Circle in Scandinavia or Russia. For the south, the answer might be Greece. For the west, most people would probably say Ireland or even Iceland. As for the east, there is a simple yet rarely known natural line of demarcation, the Ural Mountains. It is not surprising that Russia contains two of Europe’s frontiers. 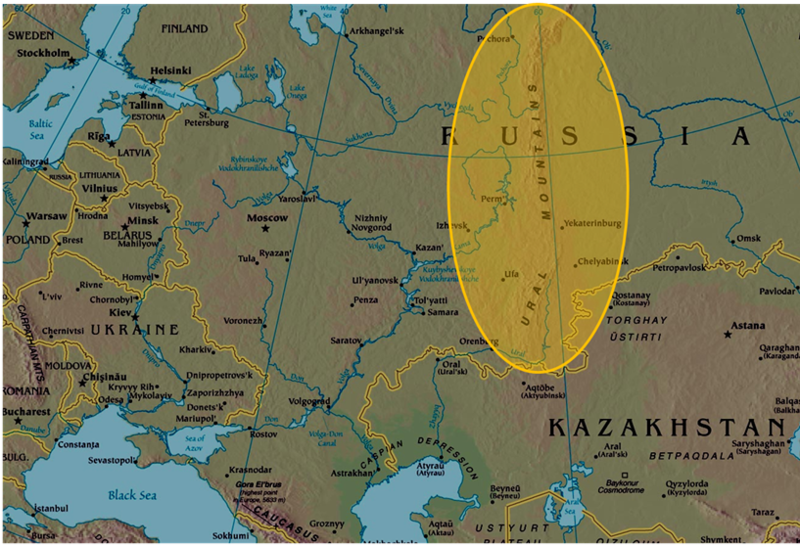 Russia is massive, even if one does not include the 75% of the nation that lies east of the Urals and is part of Asia. European Russia dwarfs all other European countries in size, for that matter it dwarfs all of Europe. It is over six times the size of the second largest country in Europe, its neighbor Ukraine. Another way of looking at it is that almost two-thirds (64%) of Europe is in Russia. Yet when the world looks at Russia, it probably only thinks of two places: Moscow and St. Petersburg. These are not only the largest cities in the country, but also the political, financial and cultural nerve centers of Russia. They have no equal, in either the western imagination or for that matter, the Russian one. Conversely, there is a whole lot more to European Russia than these two cities, everything from the Volga River Region to the Caucuses, with Europe’s most towering peaks. Yet the Ural Mountains are all but unknown. Perhaps it is because they are not all that noticeable on a map. This is because they are part of, as well as surrounded by, the world’s largest land mass, Eurasia. Nonetheless, this far eastern boundary of Europe has exerted a dramatic influence over Europe, Russia and world history during the last one hundred years. Even if few know of the Urals and even fewer visit them, this makes them no less important. The largest city in the Urals is Yekaterinburg. This was where the last Tsar, Nicholas II along with his family, was murdered in 1918. Far away from the splendor and traditions of imperial Russia, here in the Urals largest city, the Romanov dynasty came to an end. The bodies ended up being thrown down a shaft at the Four Brothers Mine, 25 miles outside the city amid the forests of the Urals. To this day, there continue to be questions over the exact events. In this region, not so easily accessed then or now, the air of intrigue is still pervasive. The frosty silence that permeates these low mountains, does not give up its secrets so easily. What is known though, a symbolic piece of the old European aristocratic order, Tsardom, was eradicated forever in the heart of the Urals. From the beginning of the 20th century right up to its midpoint, the Urals were often a transit point on a path that led to exile, imprisonment or even worse further to the east. 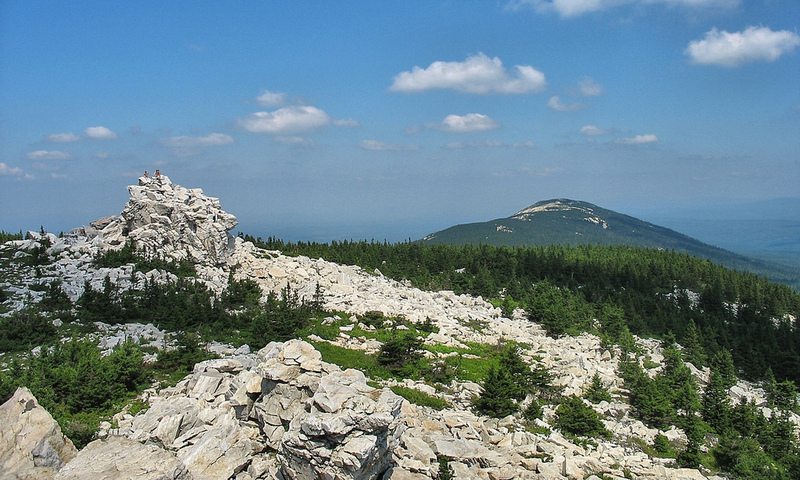 Less known, is that these mountains sheltered the strength of the Soviet Union during World War II. Over a thousand factories in western Russia were disassembled and railroaded into the Urals where they were put back together with astonishing speed. They produced thousands upon thousands of rockets, tanks and planes that were used to roll back the tide of German militarism. For those who believe that if the Germans had taken Moscow, they would have been victorious during World War II, the Urals provide a strong antidote to such historical counterfactuals. The industrial might of the Soviet Union was replicated here, fifteen hundred kilometers east of Moscow in cities such as Magnitogorsk and Chelyabinsk. To gain total ascendency over the Soviet Union and complete conquest of Europe would have meant rolling all the way into the Urals. This distance would have been extremely difficult to cross with an army, even in the maddest of imaginations. In the shadow of these low lying mountains the counter strength of the Soviet Army was being marshalled. Once unleashed, this force came roaring straight out of the European Far East and swept all before it. Eastern and Central Europe would never be the same. After the war ended, the Soviets decided to continue industrializing the Urals, this time it was to become the heart of a nuclear military industrial complex. Five of the ten Soviet secret nuclear cities, were located in the Urals region, hubs of industrial and scientific strength. The Urals were just the place for “secret” cities, since the mountain range was scarcely known and extremely vast, over 2,500 kilometers of lakes, woods and rocks, stretching from the Arctic all the way to Kazakhstan. Closed to outsiders, including almost all Soviet citizens, these cities were where much of the Soviet nuclear arsenal was constructed. Amidst one of the world’s oldest mountain ranges, these cities strove to create the materials and devices that could possibly lead to the destruction of humanity. The Cold War ended over two decades ago and the “secret” cities have long since been opened, but the Urals have remained a distant and distinct geographical entity, a world away from the European consciousness. Far away from Russia’s more famous tourist tracks, unless one lives nearby or transits the Urals, they are barely noticed. That does not mean they are no less vital to Russia’s economic and industrial strength. These ancient mountains hold innumerable minerals and ores that are of great economic value. Resource extraction fuels the Russian economy and the Urals are a focal point for these endeavors. The Urals will continue to be mined for their bountiful, buried treasure, they will continue to host millions of Russians and they will continue to provide the border between Europe and Asia. And hardly anyone will even notice. Since that time, much has been made of the fact that Nicholas’s abdication brought an end to over three hundred years of Romanov rule over Russia. While that is certainly true, of even greater consequence was that the abdication sent Russia into a spiral of chaos, lurching wildly from autocracy to anarchy. It took five epically violent years for the chaos to subside and solidify into a communist dictatorship. This was not the end though, greater catastrophes were to follow. At the time, Nicholas’s abdication manifesto struck an official and patriotic tone – a version that the Provisional Government saw fit to suppress. Meanwhile, remarks Nicholas made in his private diary at the end of that same night would turn out to be much more prescient. He scrawled, “All around me I see treason, cowardice and deceit.” What Nicholas saw was his recent past, but he might as well have been predicting the future of Russia. Ironically, this sentence by Nicholas could have been written by its forthcoming leaders, the ultimate ideologue, Vladimir Lenin and the ultimate dictator, Josef Stalin. In retrospect, of all the words in Nicholas’s abdication manifesto, “the speedy attainment of victory” was the one phrase furthest from what actually occurred. In the decades following the abdication, Russia experienced an unfathomable degree of loss. One of the places where the loss was greatest, happened to be where Nicholas abdicated, Pskov. Pskov’s brush with one of the most important historical events of the 20th century was brief. Nicholas’s train moved out that night, never to return. The last Tsar might as well have taken peace with him. The city had unwittingly been a silent witness to history. It would now move from witness to experience. Historical forces would transform the area over the next thirty years, leaving wounds that irreparably scarred Pskov and from which it has never quite recovered. With the fall of Tsarism, a violent array of competing armies, nationalities and ideologies spent the following three decades passing through, occupying or attempting to destroy Pskov. The Soviets left the most lasting impression, but not before they vanished and reappeared on multiple occasions. It was a historical act worthy of magic, black magic. They fought revolution, civil war and two world wars in the streets of Pskov. They just could not leave it alone. Neither could many others. To be on this eastern borderland of Europe was to be constantly vulnerable. Pskov was not so much a birthright as a blood rite. Consider the life of a Pskovian born in 1914. By their thirtieth birthday they would have experienced three foreign occupations, two World Wars and one of the deadliest dictatorships in human history. Rather than give medals to anyone surviving this endless succession of cataclysms, many got the Gulag instead. Pskov was too close to the enemy without and within. 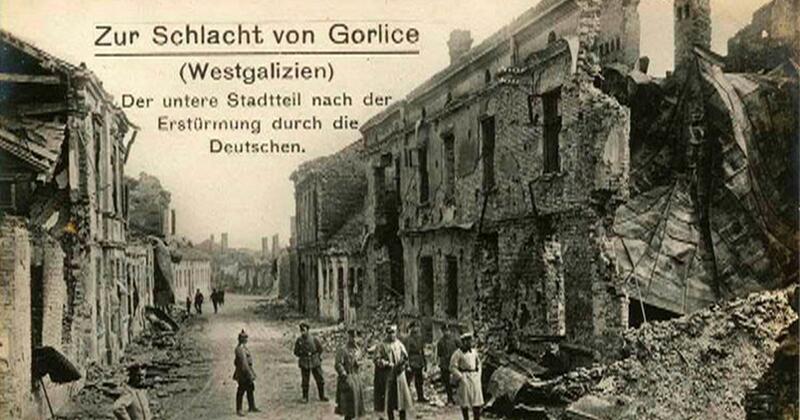 Twice during the 20th century the German Army occupied the area. The first occupation, following the end of the Great War on the Eastern Front, was relatively benign. This iteration of Germanity was more interested in extraction than execution. Pskov happened to be on one of the main rail routes the German Imperial Army used to ferret out men and material from the east. It was all done in vain, supporting an army fighting towards defeat on the western front. Less than a quarter century later, the experience was different, not by degrees, but by extremes. In the intervening years the German Army had morphed into a juggernaut. Pskov and its surroundings were soon overrun. 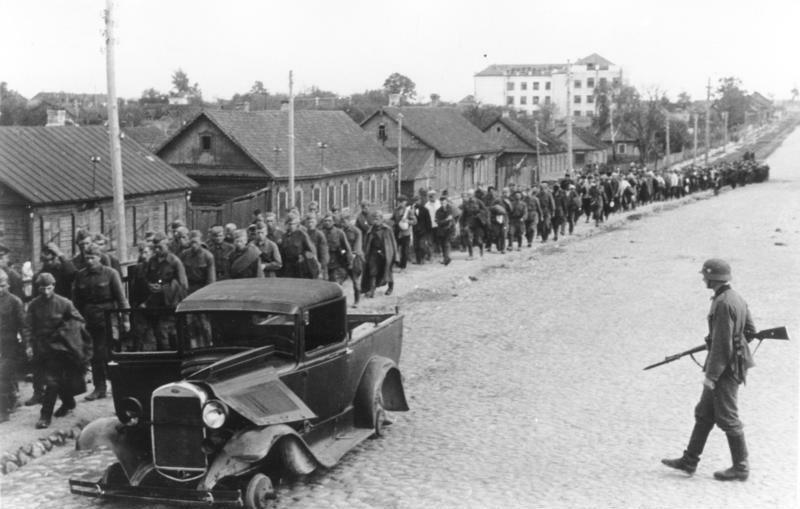 In the army’s wake came the virulent ideological strain of Nazism. From July to July, 1941 through 1944, the city’s inhabitants experienced thirty six months of pure hell. This time the occupier’s war aims were both ideological and racial. They wanted to cleanse and purify Pskov as well as the vast lands beyond of both Slav and Jew. The latter were all but executed by any means available. The former suffered horrible excesses, but reappeared with a vengeance three years and tens of thousands of lives later. Pskov was never the same again. It had lost a huge proportion of its population. In the aftermath of the war, the Soviet’s poured in resources to the rebuilding effort. The Stalinist architecture was soulless, an attempt to reshape the city in forms of concrete. Pskov never returned to the prosperity it had enjoyed before the thirty years of catastrophe which had engulfed it. Eventually with the collapse of communism and the Soviet Union it went back to its distant past, as a border city. Today it is just a fifteen minute drive from the Estonian border, but in a larger sense it is a world away. It belongs to Russia and for better or worse always has. As shown by its calamitous 20th century history it probably always will. 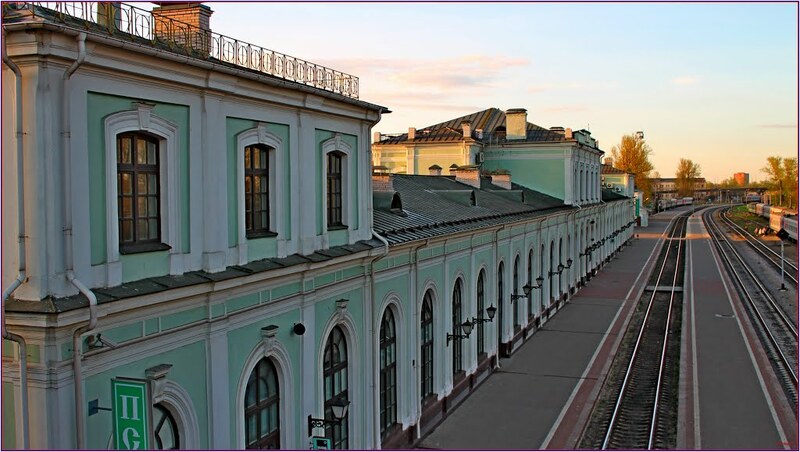 Today, on a wall of the Pskov Railway station a historical plaque has been mounted which states that the Last Tsar, Nicholas II abdicated at here in March 1917. That is an interesting fact, but does not do justice to the importance of the event. 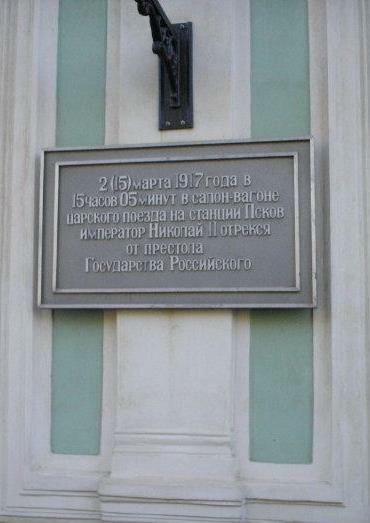 What that plaque does not say is that the Tsar’s abdication at Pskov was not really about the end of something, but instead the beginning of much worse. The importance of Pskov in the historical drama of Russia’s 20th century is not just what happened here, but what was to come. To mark the 100th anniversary of World War I, Russia is trying something totally different. They are actually erecting monuments commemorating their involvement in the war. 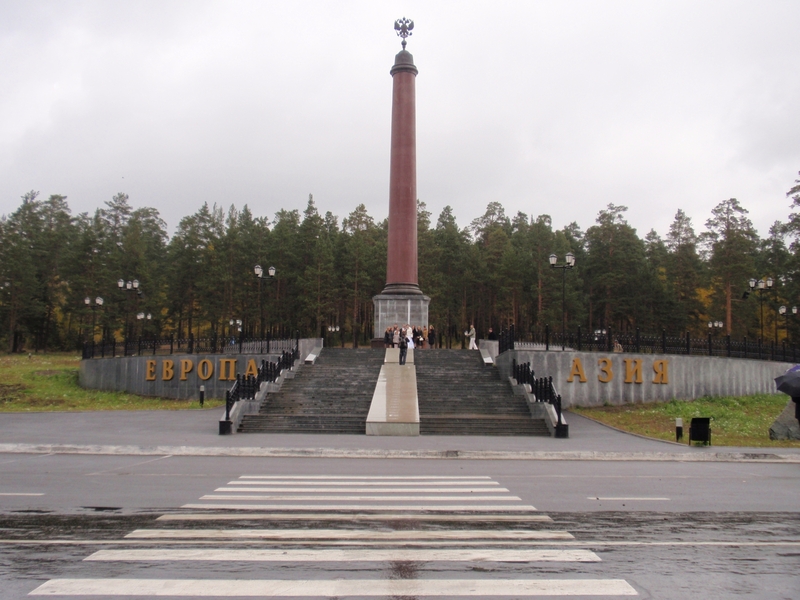 The first ever national monument for the war on Russian territory has just been dedicated in Kaliningrad. This is rather astonishing. 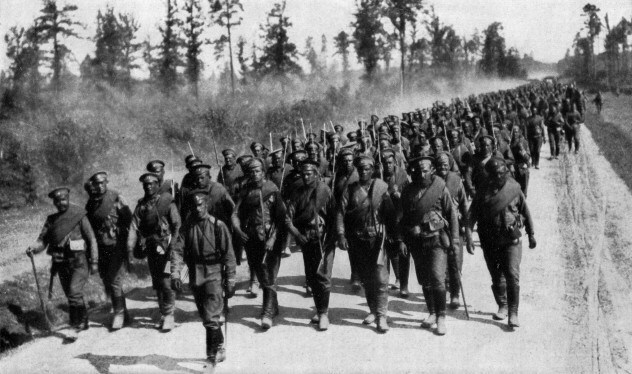 After all, more than nine million Russian men were killed, wounded, missing or taken prisoners of war. That total was greater than the entire population of such wartime belligerent nations such as Canada, Australia, Serbia, Romania and Belgium. 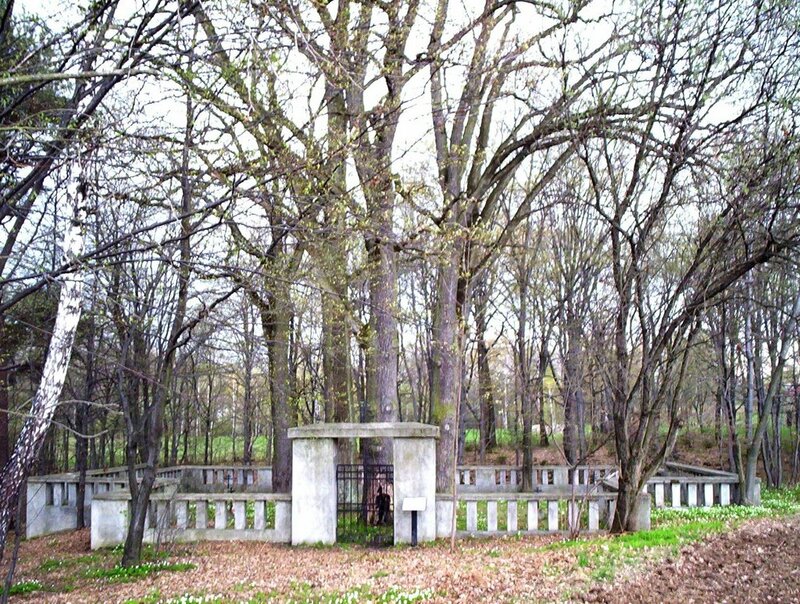 Despite their suffering, Russian soldiers did not get a single national monument to memorialize their sacrifice. This was a direct result of the Russian Revolution and creation of the Soviet Union which followed. The Bolsheviks would not allow any commemoration of the conflict which they termed a capitalist war. Conveniently they ignored the fact that the war caused dissension, bitterness, political upheaval and starvation which led directly to the Revolution. How the Russian experience of the war would be viewed was accurately predicted by at least one officer during the conflict. In the dark days of December 1916, just months before the first revolution took place, a Russian General told his soldiers, “I have a feeling that, after all this is over, we are not going to be thanked for all the hardships and privations which we are going through now. Rather, that this is all going to be held against us.” Those words predicted both the immediate and long term remembrance of the First World War in Russia. As Catherine Merridale states in her classic work Night of Stone: Death and Memory in Twentieth Century Russia, “It (World War I) shaped the way even the revolutionaries saw their world, colored their view of death, brought millions of their future subjects into contact with violence and fear for three long years before they came to power and brought it to an end. It claimed not tens, but millions of lives. Because it was not commemorated after 1917, however, it vanished from the Bolshevik foundation myth. Few stories illustrate the power of social memory more clearly. 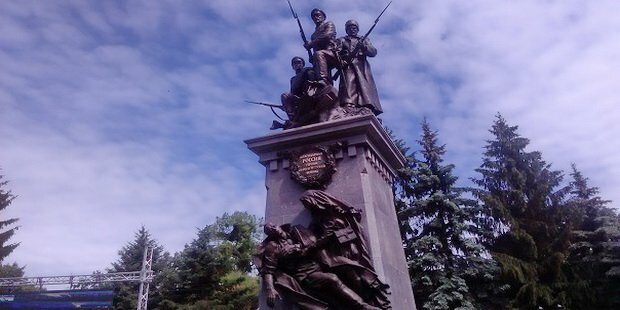 There is no Soviet National Monument to the First World War.” The vast and dramatic effect of the war on Russia and what would become the Soviet Union are not in dispute. It is hard to imagine that without the cataclysm of World War I, Russia would have had the type of revolution that brought the Bolsheviks to power. Russia may well have had a revolution anyway, just not one that would turn out to be as radical and deadly. The war had set the precedent for what was to come. 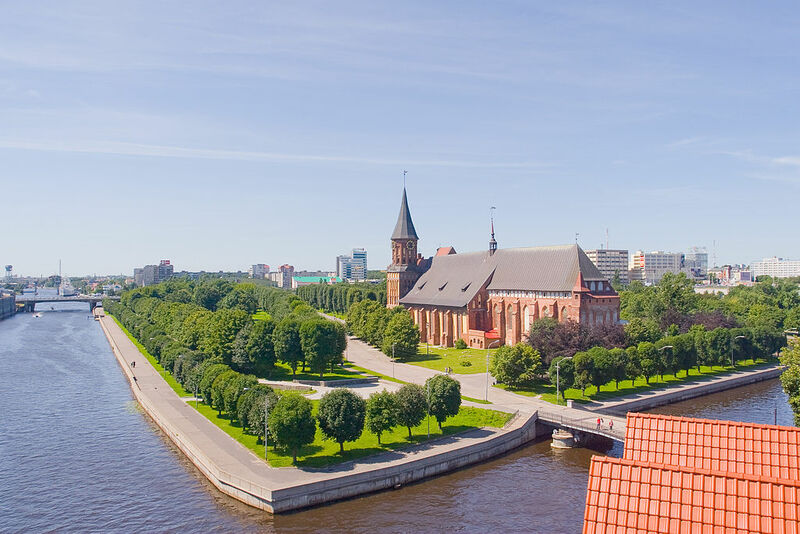 It is fascinating that the first Russian national monument to the war has now been placed in Kaliningrad (Konigsberg, East Prussia during the war). Ironically this was a place the Russians were never able to occupy during the war. Early on, they attempted to besiege the city, but their effort was short lived. The Battle of Tannenburg further to the south destroyed the entire Russian Second Army. The First Army, which was given the job of investing Konigsberg then found itself in a fight for its existence. It soon gave up a siege which had barely begun. Soon the Second Army lost the First Battle of Masurian Lakes, causing a Russian retreat from Prussian soil. They would not return again until exactly 30 years later, now as the Soviet Army, during one of the final campaigns of World War II. Once again they found themselves on Prussian ground and this time they made sure it was the last. Within a year of their arrival, Prussia ceased to exist. Konigsberg was soon renamed Kaliningrad. Even after the Soviet Union crumbled, the Russians kept this exclave of territory as a lasting prize from the Second World War. Konigsberg had been the seat of power for Prussian kings throughout the centuries. 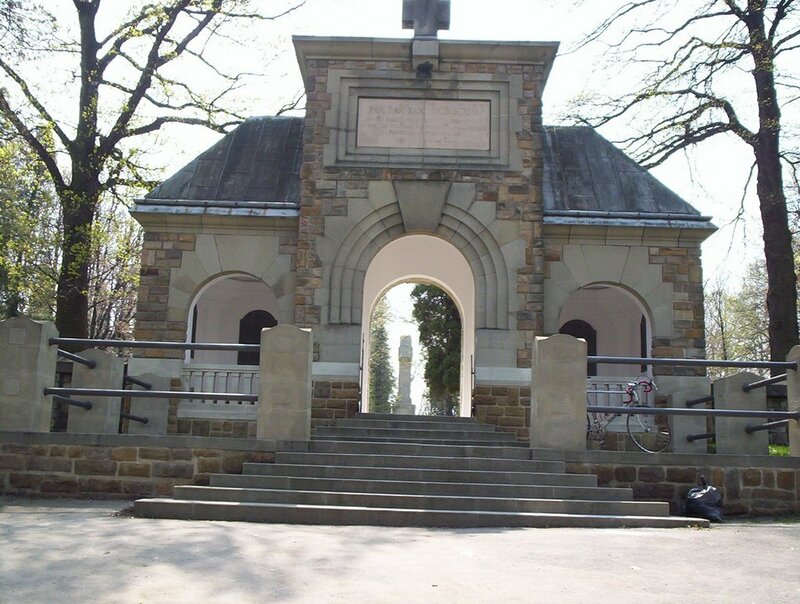 It was said to be the heart of Prussian militarism, a scourge that had scarred Russia and the Soviet Union badly in each of the two wars. By imposing Soviet style communism on it, they eradicated nearly every lasting vestige of its former Prussian self. The brand new, eleven meter high monument in Kaliningrad now stands as a testament to both the various groups who sacrificed so much during the war and also a process of un-forgetting that is slowly taking place. Three soldiers are portrayed: a nobleman officer, a peasant and a third who represents governmental workers and lower court officials. It suggests commonality, a shared unity among all three groups that must have been present to a greater or lesser degree throughout the first two and a half years of the war. That unity eventually frayed as the empire suffered one catastrophe after another. It is hard to imagine how any other state could have stayed together under the circumstances. Considering the millions of lost lives, it is even harder to imagine how it lasted as long as it did. The eleven meter high monument is one of several that will be dedicated this summer. The piece de resistance will be unveiled this August in Moscow. These monuments can never make up for lost time, but at least do a bit of justice to the memory of millions who lost their lives. To both western and eastern Europeans, the Battle of Lake Naroch does not exist. Knowledge at best is limited to a few obsessive World War I aficionados squirreled away in a campus basement of the Russian studies department. At best, they might mention the battle as one of many examples for the gross mismanagement of the war by the Russian Empire. For those unfamiliar with the Battle of Lake Naroch, it occurred in late March of 1916. The Russian Empire had been asked by their allies, specifically the French, to relieve the massive pressure being placed upon it by the German attack on Verdun. The Russians were not exactly in the best shape to mount an offensive at this time. They were suffering from an acute shell shortage while in the process of recovering from the defeat inflicted upon them in the Gorlice-Tarnow campaign the previous year. Nevertheless, they agreed to an operation which would draw German forces away from Verdun to the Eastern Front. Too say that early spring was not the best time of the year for the Russians to stage an offensive would be an understatement. Actually, it is hard to imagine a worse time in western Russia to mount an offensive than the late winter/early spring. This is when the annual thaw takes place. After long, bitter months of cold, the first hints of spring arrive in fits and starts. The frozen ground begins to slowly dissolve into a watery muck. 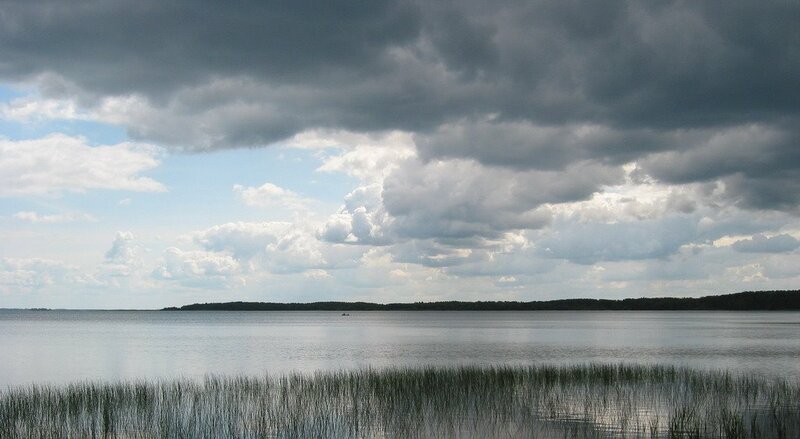 Lake Naroch is located in what is today western Belarus, an area known for its swampy, marsh laden ground. The slush filled muck which materializes each spring brings impassable conditions. Add to this, the fact that Russian roads were notoriously awful, little more than vague tracks in many places. Even good metaled roads would disappear beneath an icy syrup of muddy water. Offensive operations in this environment were nearly impossible. The Germans opposing the Russians on the Eastern Front understood this. The common Russian soldier who experienced this wasteland first hand must have realized this as well. Unfortunately, the Russian leadership did not. Tsar Nicholas II felt that it was important to support his allies no matter what the cost (this was part of the reason he would lose his throne). The Russian commanders at the front were neither resourceful nor logical. They treated the brave, peasant soldiery with contempt and felt no compassion for these men. This led to one of the worst disasters in a Russian war effort that was filled with them. The strategy and tactics of the Battle of Lake Naroch need not detain us for long. A few telling details and anecdotes will suffice. Consider that Russian forces outnumbered their German counterparts by three and a half to one, but sustained five times the casualties. Five times! On the very first day of the battle, the Russians lost 4,000 men compared to 200 for the Germans. How did this happen? During the day, Russian soldiers assaulted German positions defended with heavy artillery and machine guns that were calibrated with deadly accuracy. The Russian soldiers did not so much assault as wade into battle. At times, they were up to their wastes in frigid water. Then at night, temperatures would plunge below freezing, cementing the troops to the ground. Companies froze in place and had to be cut out of the ice. They were riven with frostbite. The official figure of 100,000 wounded for the Russians is only a rough approximation. There was no accounting for those who due to hypothermia, frostbite or sickness were rendered useless. The Battle of Lake Naroch was a disaster, but a relatively unknown one. It could be called “missing history,” as it falls into an abyss of space and time unique to Russia. It was swallowed in the vast spaces of the Eastern Front, where large battles with untold casualties took place. Much of this has been lost to history, as historical consciousness has never really grasped the sheer breadth and brutality of this front. Lost in that space as well, a vast sea of humanity that drowned or froze in the marshes, swamps and slate gray waters of Lake Naroch. The battle was also lost in time, as it was swept away by the whirlwind of the Bolshevik Revolution. 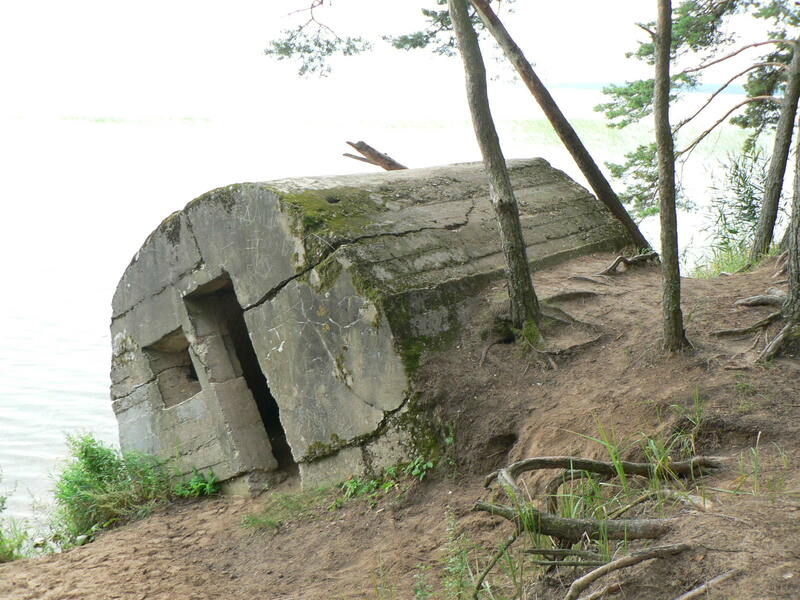 The valor and tragedy so indicative of the Russian soldiers experience in the First World War at battles such as Lake Naroch was eventually written out of the history books. According to the Bolsheviks, these imperialist forces were fighting for the wrong cause, not one worth dying for. Yet the Bolsheviks failed to mention that without the folly of this war, without those men wading into those icy waters, there would have been no revolution. Perhaps the Battle of Lake Naroch is most notable today for what it represents, as opposed to what actually occurred. It represents the folly of war, good men dying for a lost cause. The battle also represents a Russia today – the largest nation in the world – that can be searched across all eight of its times zones, but does not have one official monument to the eight million men who died fighting in the First World War. Now that is truly “missing history.” What a shame that the Battle of Lake Naroch is unknown to the west, what an even greater tragedy that it is unknown to Russia.